Connect students to the stories of history. Connect students to success in history. Connect students to the experience of history. At McGraw-Hill, we have spent the past few years deepening our understanding of the student and instructor experience. Employing a wide array of research tools including surveys, focus groups, and ethnographic studies, we've identified areas in need of improvement to provide an opportunity for greater learning and teaching experiences. The new edition of The West in the World is a direct result of this in-depth research. 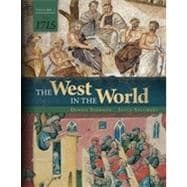 The West in the World’s newest edition is also a first in the teaching and learning of Western Civilization. Its groundbreaking web-based digital solution, its unique mid-length and lively narrative, and its rich, outstanding visuals creates a unique teaching and learning environment propelling greater student success and overall improved course results. Instructors gain better insight into students' engagement and understanding as students develop a base of knowledge and construct stronger critical thinking skills. Unparalleled coverage of art and culture as well as science and technology sets the stage and provides rich insights into historical time periods and events. The captivating stories and lush images keep students turning the page, helping prepare for class discussion and course work while its new teaching and learning platform, Connect History, enables students to engage with the course content on a greater level. The West in the World illustrates the significance of economic, political, social and cultural interactions that shaped Western civilization while asking students to analyze the events and themes in order to build a greater understanding of the past and an appreciation of history's influence on the present. With The West in the World, students are no longer simply reading; they are reading, interacting, and engaging in a visual, auditory, and hands-on learning experience. As students uniquely experience the history of Western Civilization, The West in the World propels students to greater understanding and the achievement of greater course success. Experience The West in the World and experience greater course success. Struggling with the Forces of Nature: Mesopotamia, 3000-ca. 1000 B.C.E. Rule of the God-King: Ancient Egypt, ca. 3100-1000 B.C.E. Terror and Benevolence: The Growth of Empires, 1200-500 B.C.E. Global Context Essay, I. Looking Ahead to the Ancient World: 700 B.C.E. to 400 C.E. The Rise and Fall of Ancient Heroes, 000-800 B.C.E. Greece Enters Its Classical Age, 479-336 B.C.E. The Successor Kingdoms, 323-ca. 100 B.C.E. The Rise of Rome, 753-265 B.C.E. Expansion and Transformation, 265-133 B.C.E. The Twilight of the Republic, 133-44 B.C.E. The Pax Romana-27 B.C.E. to 192 C.E. Crisis and Transformation, 192-ca. 400 C.E. From Christian Persecution to the City of God, 64-410 C.E.